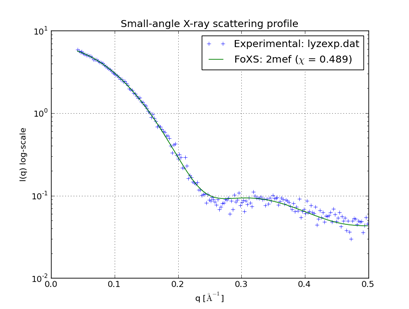 FoXS: a web server for rapid computation and fitting of SAXS profiles. Schneidman-Duhovny D, Hammel M, Sali A. Nucleic Acids Res. 2010 Jul 1;38 Suppl:W540-4. There are several ways to start Small-Angle X-Ray Profile, a tool in the Higher-Order Structure category. Water molecules are automatically ignored. Optionally, an Experimental profile can be read from a file. If an experimental profile is provided, the theoretical profile will be scaled to fit the data. The file should contain an initial comment line followed by three whitespace-preceded columns: q value, measured scattering, and measured scattering error (see an example file for lysozyme). The error values are used for fitting but are not plotted. For comparison to experimental data, the structure should be as similar as possible to the experimental sample in terms of which atoms are present (not missing domains, loops, or parts of residues). Dock Prep can be used to repair truncated side chains and/or add explicit hydrogens. Implicit hydrogens (on by default) - whether to ignore any explicit hydrogen atoms and consider hydrogen atoms for proteins and nucleic acids implicitly by adding their form factors; for proper recognition of these residues, the structure should have standard PDB atom and residue names. If the structure includes other groups (lipids, sugars, etc. ), this option should be turned off and explicit hydrogens added instead. For further details, consult the FoXS help. Clicking Calculate Profile computes the theoretical profile and displays it as a solid line. Data points in the experimental profile (if any) are shown as plus signs, and a measure of the quality of fit between the experimental and theoretical profiles, χ, is given in the legend. A lower value of χ indicates a better fit. Close dismisses the Small-Angle X-Ray Profile dialog. Help opens this manual page in a browser window. Plots are generated with matplotlib. Icons for manipulating and saving the view are provided below the graph. The mode icons act as toggles: clicking the icon will turn the mode on or off, depending on the current state.